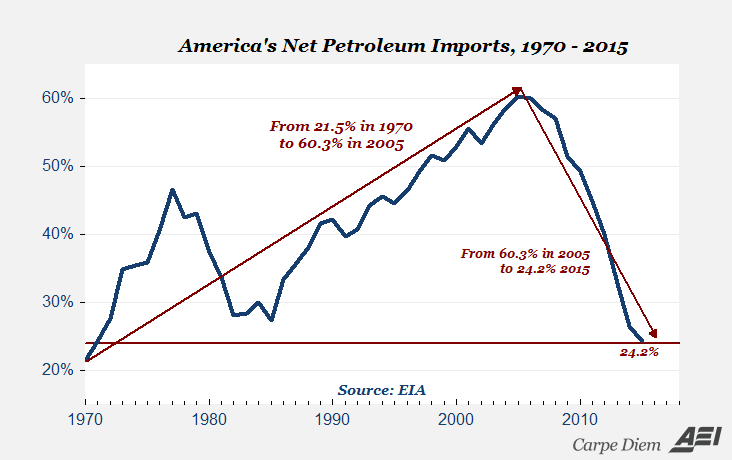 Mark J. Perry’s recent post at Carpe Diem Blog titled; Some Charts And Updates On America’s Amazing Shale Revolution, It’s Not Over Yet, shows how economic forces are always in play even when we think they’re not. When the price of oil was over $100 dollars a barrel and gas was close to $4 a gallon in 2014, who thought oil would get down to $30 dollars a barrel and gas would sell for under $2 a gallon? The law of supply and demand states that more will be produced at a higher price than a lower price. Higher oil prices made fracking economically viable. The American shale industry took off, in spite of the Obama administration making oil rich government land off limits to fracking. The shale industry started drilling on private land. Even though a portion of the investment in the shale industry may be an artificial bubble, thanks to the fed printing money, the reality is that fracking is now viable at lower and lower prices per barrel. Some marginal companies are going bankrupt because of the lower prices, but you can rest assured these evil oil companies won’t be bailed out by our green energy loving government, which is good. These marginal producers will be purchased by more viable companies and whatever malinvestment the Fed created will be purged from the shale industry. The housing bubble should have been allowed to find the bottom, instead of the Fed pumping money to keep the correction from happening. This is what should have happened to GM instead of being bailed out by Bush and Obama. Economic forces are always in play even though government tries to keep them at bay through regulation, taxes, or money printing. Even though it may take some time, economic forces always win. Just ask the leaders of the former Soviet Union. Here are some charts and quotes from Mark J. Perry’s article (click above). 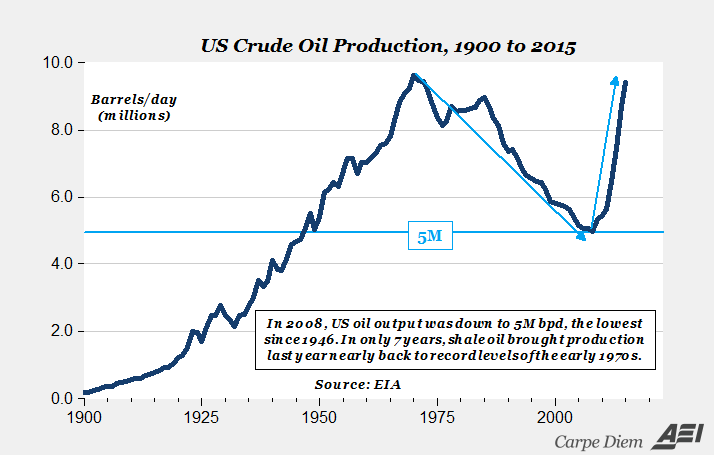 US oil production is almost up to early 1970s levels. 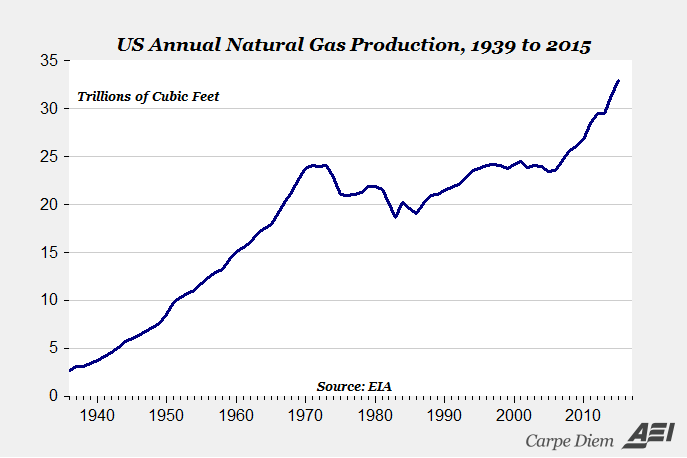 US natural gas production is at all time highs. Low oil prices have had a positive economic impact, even though the Wall Street experts say the low prices are bad. In fact the Obama administration couldn’t claim any US job growth if it wasn’t for the jobs created in the fracking industry. And the Obama did everything it could to halt fracking. Excerpt from the article. We are becoming more energy self sufficient. The OPEC Cartel has been brought to its knees by the American shale revolution. America’s shale revolution isn’t going anywhere. In fact we are probably at the end of the beginning of the revolution. Related Article – Free Market Fracking Trumps Government Solutions When It Comes To Producing Energy, at austrianaddict.com. Related Article – Wind And Solar Energy Is Diluted and Intermittent, Which Means More Costly, at austrianaddict.com. This entry was posted on March 2, 2016 at 9:19 pm and is filed under Econ. 101. You can subscribe via RSS 2.0 feed to this post's comments.